You may have heard of the movie Once. It won an Oscar at this year's Academy Awards for Best Original Song and was nominated for something like 18 other awards. I had the pleasure of watching it for the first time last night and was so incredibly moved by it. The film takes place in Dublin and follows its two nameless protagonists, a broken-hearted Irish songwriter who performs on the streets played by Glen Hansard (he looks like Joshua Jackson and sounds like Damien Rice) and a Czech immigrant girl who cleans houses and sells flowers on the street played by Markéta Irglová. Despite their difficult and ordinary lives, they are both extraordinarily talented. They are both songwriters. She plays the piano and he, the guitar, and they both have beautiful voices. I don't want to give away too much. It is just a beautiful little film with powerful, haunting, gorgeous music. It just premiered on HBO last night, so keep an eye out for the next showing or order it on Netflix. You'll want to see it and listen to the beautiful music more than once. In the mean time, I'll leave you with a few clips so that you can experience the incredible music and touching story for yourself. 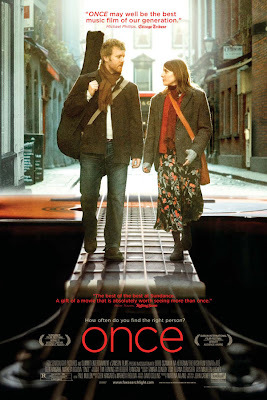 Making Music Together for the First Time: "Falling Slowly"
This sounds like a smart film, very intersting characters! Any idea when it will be out on DVD? Or if it's out already? Thanks! ^ It is out on DVD. We own it. It's one of the most incredible films I've ever seen - so full of raw emotion, fabulous music and just so memorable! I haven't watched it in a while, but you reminded me to! Paloma, I agree! This was a really charming and refreshing movie about a couple of talented people. Thank you for the info princess a - sounds like I know what I am watching over the weekend! Can't wait! I love this movie. I own it on DVD and have the soundtrack. So great, it makes you feel hopeful. This movie is wonderful indeed. I love listening to the soundtrack all the time! Glen Hansard looks and sounds like Glen Hansard. Though I completely agree that the movie is amazing and well worth checking out.